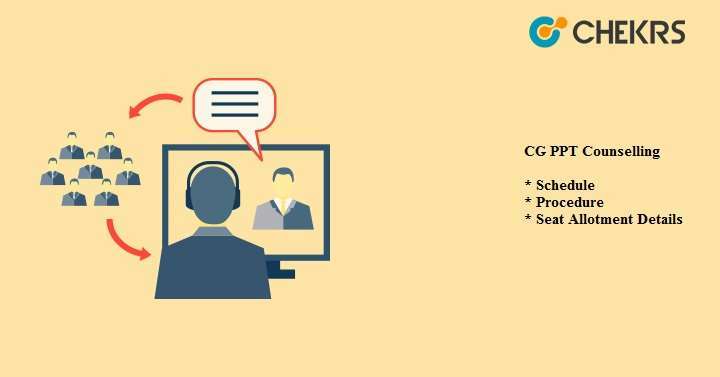 CG PPT Counselling 2018: Chhattisgarh Pre Polytechnic Test(CG PPT) is a state level entrance exam, which is organized by Chhattisgarh Professional Examination Board (CPEB). With the help of the CG PPT Exam, applicants get the admission in the various institutes of polytechnic in the state Chhattisgarh. In this article, we are providing the details regarding the CG PPT Counselling 2018. The applicant can read this article to know more detail about the counselling. The Applicants who are going to attend the counselling is required to know the CG PPT Counselling Scheduled. The Counselling process is started on the 27 June 2018. The other important dates regarding the counselling are given in the table. When the counselling is organized some of the applicants faces trouble as they don’t know what is the going in the counselling. So the applicant who doesn’t know the procedure is required not to worry. We are providing here the details of CG PPT Counselling Procedure. The applicant can read this detail to get the idea of the counselling. Firstly applicants are required to do the registration in online mode in the official site of CG PPT and required to pay the fees. After doing the registration applicants are required to fill the choices of the college and required to select the course as per their interest. After selecting it applicants are required to click on the save button. After filling of the choices applicants are required to verify their document at their document verification centres. A list of DVCs will be published on the official website. After document verification, the seat allotment is done on the basis of the no. of seats available and the choices filled by the candidate. The applicant will get the information of seat allotment through the SMS. The applicant can download their provisional seat allotment letter through the applicant login option. At last applicants are required to report at the college for the admission formalities and the document verification. Applicants are required to carry all the document with the application fee at the time of the final admission. When the CG PPT Counselling is organized applicants required to bring the original document for the verification purpose. After the Verification of the document is done applicants go to the next round of the counselling i.e. allotment of seats. The CG PPT Counselling Document List is provided below. The information provided here is as per the official notification. Applicant must be present on the day of the counselling scheduled. If the applicants have any queries regarding the CG PPT Counselling they can contact us through the comment box.